When people cooperate instead of compete, they are more likely to build on each other’s ideas and explore new ideas. Creativity in a group setting is important to produce original work, but how cooperation and competition can enhance or hinder group creativity is still unclear. The neural processes involved in a group’s creative performance also remain unclear. This week in Cerebral Cortex, Lu, Xue, and colleagues scanned the brains of two people simultaneously while they completed tasks in competitive or cooperative modes, and measured creative performance. Their goal was to understand which mode fosters group creativity and what brain regions are involved in this process (including how synchronous brain activity is between individuals in the group). The study included 104 young adults (64 women), and participants worked in pairs with other participants they did not know. Pairs of participants were randomly assigned to complete one of two tasks (the Alternative Uses task or the Object Characteristic task), and each pair completed their tasks in both cooperation and competition mode. In the Alternative Uses task, which measures divergent thinking, participants generate alternate uses for everyday objects. In the cooperation mode, participants were asked to cooperate with each other for better group performance, while in the competition mode, participants were told the other participant was their opponent and that the winner would be determined by comparing performance between the two participants. In the Object Characteristic task, participants thought of characteristics of everyday objects (testing their memory, but not divergent thinking). In this task, participants were similarly asked to perform the task in cooperation or competition mode. In both tasks, participants took turns stating their answers. Performance on the Alternative Uses task was quantified with the number and originality of the ideas generated, and performance on the Object Characteristic task was quantified based on the number of characteristics generated. 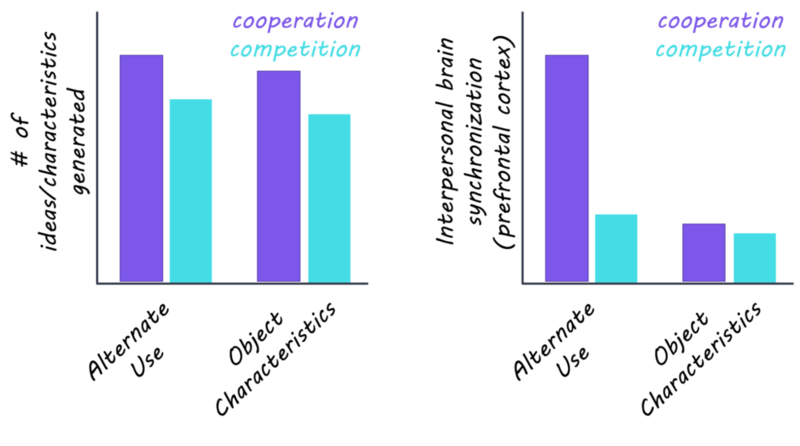 The extent to which participants combined their ideas or thought of ideas in the same topic/category was also quantified as an index of cooperation. To measure brain activity during these tasks (while participants faced one another), the authors used functional near-infrared spectroscopy (fNIRS) – a technique in which sensors are placed on the scalp to detect changes in blood oxygenation in the brain. Probes that contained several measurement channels were placed over the prefrontal cortex and right temporoparietal junction (rTPJ), brain areas known to be involved in group creativity. Interpersonal brain synchronization was calculated as coherence between a given pair of measurement channels between two individuals. A frequency band of interest (0.042-0.045 Hz) was chosen as interpersonal brain synchronization increased during the Alternative Use task (compared to while at rest) in both the prefrontal cortex and rTPJ in this band. Across tasks, the number of idea/characteristics generated by participants was greater in cooperation mode versus competition mode. Originality of ideas in the Alternative Uses task and a behavioural index of cooperation (both participants having ideas in the same category) were higher in cooperation mode. In the prefrontal cortex (right dorsolateral prefrontal cortex region), interpersonal brain synchronization was higher compared to baseline/rest in the Alternate Use task during the cooperation mode, but not in any other task or mode. Higher interpersonal brain synchronization predicted greater cooperation. In the rTPJ, interpersonal brain synchronization was greater during the Alternative Use task versus the Object Characteristic Task, particularly during cooperation mode. Finally, interpersonal brain synchronization between the prefrontal cortex and rTPJ was also higher in the Alternative Uses task in the cooperation mode versus in the competition mode. This study found that group creativity was greater when individuals cooperate to complete a task, and that brain synchronization between individuals predicts the level of cooperation on the task. These results have implications for understanding how creativity is cultivated in a group setting. Greater brain synchrony between people was associated with greater cooperation, suggesting that greater synchrony is indicative of better interpersonal interaction. Lu et al., Cooperation Makes a Group be More Creative. Cerebral Cortex (2018). Access the original scientific publication here.